Sometimes we do judge (select) a book by its cover. Its lovely cover was what first drew my attention to Doubtful – a romantic suspense novel by Ann Warner. For Dr. Van Peters, Doubtful is a retreat after a false accusation all but ends her scientific career. For journalist David Christianson, it is a place of respite after a personal tragedy is followed by an unwelcome notoriety. Neither is looking for love or even friendship. Both want only to make it through another day. But when violence comes to Doubtful, Van and David’s only chance of survival will be each other. Doubtful is a well written story centering around David and Van, who take an instantaneous dislike to one another. They are both nursing emotional wounds from the past, and are thrown together by circumstances beyond their control. The story alternates between their perspectives, highlighting each character and deepening the reader’s understanding of them as individuals as the story progresses. I was sorry to see that the mystery elements were not as well developed as the romantic ones, especially as regards resolution of the criminal aspects of the story. It was a good read that I expect fans of romantic suspense will enjoy. BTW, New Zealand was already on my bucket list… based on the author’s descriptions, I think it just moved up a few spots. FTC Disclosure: I received a complimentary ARC of this book from NetGalley. This has not affected the content of my review in any way. As part of a Blog Tour organized by Great Escapes Virtual Book Tours, I recently read Lies She Told, an engaging psychological thriller by Kim Davis. This was a unique and intriguing read that starts out by following two distinct storylines with the point of view switching between Liza (the writer) and Beth (her made-up character). The book starts out slowly as you become acquainted with the players, but the pace picks up quickly as both Liza and Beth find themselves in complicated situations. Both characters were well developed. It was easy to identify with Liza’s yearning to be a mother and with Beth’s distress at the state of her marriage. The partial mirroring of the two plots – Liza’s story and the story she was writing – led to a blurring of the line between reality and fiction. The path to the story’s resolution was peppered with suspense and twists that kept me turning the pages. It was an enjoyable read, however the ending didn’t feel “right” to me – not so much in terms of the killer’s identity but more in that the factors that led to the killer’s actions seemed a bit far-fetched to me. Click to enter a Rafflecopter giveaway for a chance to win a print copy of Lies She Told. As part of a tour organized by Italy Book Tours, I am happy to have Lucy Appadoo as my guest as she celebrates the release of Dancing in the Rain, the third novel in the Italian Family series. At twenty-three years of age, I travelled to Piaggine, Italy and spent three months visiting the cities and villages. I not only visited the villages of Laurino, Batibaglia, and Positano, I also spent time in Rome, Florence, Salerno (the Amalfi Coast), and Venice. I would’ve loved to have travelled to more of the amazing cities but I didn’t get the opportunity. I spent time in the piazza in Piaggine with my cousins who would visit with their friends every night. I’d walk in the square with my one or both of my male cousin/s and each night a friend of theirs would buy us an alcoholic shot that was mixed in a glass test-tube like glass. Each night, I’d try a mix of cocktails in a test tube. On that square, you had a bar and café, a bakery, and a restaurant. I loved staying at my aunt’s house as she lived upstairs in the bakery while her friend worked and lived in the bakery downstairs. Each day, I’d enter her home and the aroma of freshly-baked bread would permeate my senses. It was heavenly, and I would bite into the soft, doughy texture of fresh Italian bread. We’d eat the bread with a glass of wine or with food. Amazing! Piaggine is a beautiful village, mountainous, hilly, and with rough terrain around the farms. The stone houses felt cold inside but the wood fire ovens were great for home cooked meals. I would eat home-made bread, home-made sausages, home- made tomato sauce, fresh pasta, and home-made wine. Many things were made by hand, and the joy the Italians had from making something from scratch was captivating. Exploring Italy in my 20s was amazing but I would have liked to explore more of the country. The history of the country left me feeling nostalgic when I returned back home to Melbourne. How can you compare the city of Melbourne with the cities in Italy and all its fabulous history. Impossible!! Click here to enter a Rafflecopter giveaway for a chance to win a $50 Amazon gift card. Today’s post showcases “Waves of Murder,” the latest addition to the Fiona Quinn mystery series by C.S. McDonald. I haven’t had a chance to read it yet, but it sounds like a great beach read. And it is my pleasure to have C.S. McDonald on my blog today to answer a few questions about her recent release. The Fiona Quinn Mysteries are set in Pittsburgh. Have you ever been there? I sure have! I was born and raised in Pittsburgh—and yes, I bleed black and gold. In fact, Fiona Quinn (our heroine) is a kindergarten teacher at the elementary school that I attended and she lives at 529 Oxford Street—in the very same house I grew up in. When I describe the house, it is exactly as I remember it. Now, let me be clear—my grandmother never lived in the attic, but isn’t having a ghostly grandma fun? Many Pittsburgh venues are mentioned in the books as well. Example: in book #1 Murder on Pointe the story revolves around the Benedum Center—one of Pittsburgh’s premiere theaters. In Waves of Murder, you move the stories from Pittsburgh to Presque Isle in Erie, Pennsylvania. Why did you take Fiona there? As a child that is where my family vacationed. It was the only place my parents could afford to take us. I loved the beaches of Presque Isle, and I still visit the area every summer. I knew that Fiona had to visit this terrific beach, but her experiences are less relaxing than mine usually are. Poor Fiona encounters a murder—I’m happy to say this has never happened to me! If you had to choose an actress to portray Fiona, who would you pick? Kaley Cuoco hands down! Every time I watch Big Bang Theory I think—Wow! She would make the perfect Fiona! No. For twenty-six years I was a professional dancer/choreographer. I retired in 2011 and have not looked back. Whether I am working on my romantic suspense series or the Fiona Quinn books, I love writing! As a child, I used to write stories all the time, and as a child, I danced. Interesting how things come full circle—I was a professional dancer, and now I’m a writer. My husband, Bill, has been such a great supporter of my work for years—both in the dance studio and at the laptop. Unfortunately, I feel the person who would’ve been most proud of my success as a writer would have been my dad. He loved to read, and as proud as he was of my dance career, the man would have burst at the seams with pride when I published my first book in 2011. He would’ve been showing my books to anyone who would look, no doubt. My father passed away very unexpectedly in 2005 so he never got to see my writing career, but I know he is watching from above with a big toothy grin on his face! What’s so bad about that? The author insists Fiona must work on the manuscript at her beach cottage on Presque Isle–three hours away from her yard and Nathan. Spending six weeks in an adorable cottage on a private beach doesn’t really seem all that bad until people start turning up dead—beginning with the author! Fiona’s summer of sun and sand is instantly transformed into a murder investigation. Can Fiona and Nathan crack the case or will the murderer get away on a wave of deceit? Enter a Rafflecopter giveaway for a chance to win a signed copy of Waves of Murder: A Fiona Quinn Mystery by C.S. McDonald (open to USA only – 2 winners). As part of a Blog Tour organized by Great Escapes Virtual Book Tours, today’s spotlight is turned on Treasure in Paradise, a new cozy mystery by Kathi Daley. Tj Jensen and her family head to Turtle Cove Resort for summer vacation, but their plans for rest and relaxation are thwarted when they find a dead treasure hunter in the attic of the resort’s main house. Initially vowing not to get involved, Tj quickly changes her tune when the Gull Island deputy on the case closes it after a bare bones investigation. All evidence points to foul play, and Tj’s determined to uncover what the deputy wants to keep hidden. With the help of her best friend and a chatty parrot, Tj digs up a centuries old legend, a hidden map, and secrets buried deeper than pirate’s treasure. There is magic in beginnings. Some beginnings come as a rite of passage, such as a graduation from college, the birth of a child, or a wedding day. Other beginnings start off more subtly, as nothing more than an ordinary moment that evolves into a crucial event that, in the end, helps define who you are and who you will become. And then there are the beginnings that arrive on the heels of change. At times we welcome this change with joyful anticipation, while at others we fight to maintain that which we feel we’ve lost. Change can come in gentle waves that shepherd us into a new reality, or it can come in a tornado of destruction that tears apart everything we hold dear to our hearts. My own new beginning occurred when I packed up two sisters, a grandpa, two very dear friends, four cats, and three dogs, and traveled across the country to help an old friend of my father’s renovate the oceanfront resort he’d been forced to sell. The resort, which consisted of a resident’s home and twenty cabins nestled artfully on a long stretch of beach on the southeastern corner of Gull Island, had been in Garrett Hanford’s family for four generations. Garrett was an only child who’d never married or had children of his own, so when his health began to fail he’d decided he had no choice other than to sell the property he was no longer capable of managing. The problem was that the resort had fallen into disrepair, and the only buyers interested in the large slice of oceanfront land were developers who didn’t care about the cabins because they planned to tear them down and build a new infrastructure from the ground up. Garrett didn’t want to sell to those large corporations, so in spite of the fact that he was not likely to recover his investment, he’d decided to put some money into the resort and renovate the buildings prior to looking for a buyer who would maintain the integrity of the property he loved. When I learned Garrett had suffered a stroke and would need someone to oversee the renovations, I jumped at the chance to take a step away from a life that had undergone so many changes in the past few months that I no longer recognized it. What I didn’t expect was that by agreeing to spend the summer on Gull Island, I would be trading one set of problems for another. “Someone from the sheriff’s office should be here in a few minutes,” my best friend, Kyle Donovan, informed me as he joined me in the attic of the three-story house where the two of us, along with my two half sisters Ashley and Gracie, my Grandpa Ben, and a dear friend, Stan Griffin, planned to live that summer. I grimaced. 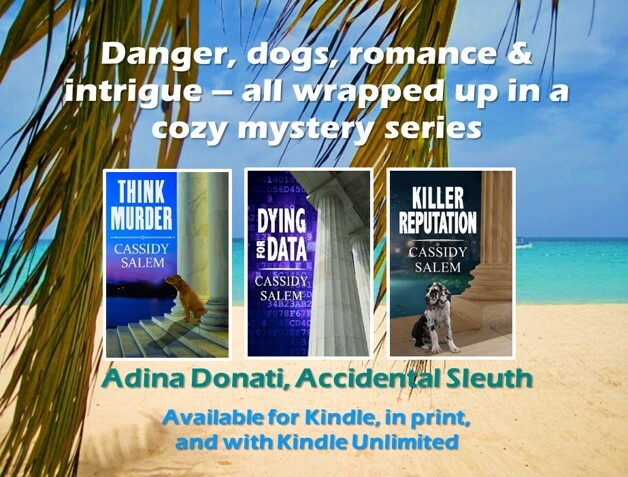 I don’t know exactly what I expected to find on my first day in over twenty years at Turtle Cove Resort, but in spite of my reputation as an amateur sleuth, I certainly didn’t think I’d be thrust into a murder investigation before I’d even had a chance to unpack. “Are you okay?” Kyle asked as Doc slipped on the latex glove he carried in his wallet and took a closer look at the body. MK Harkins recently released what has been heralded as a gripping YA Contemporary Romance. I haven’t had a chance to read it yet, but Famous by Default looks like a promising read – a sweet romance that touches on social issues. Buried, By my family’s fame. Dying to escape the limelight, And finally, I do. Being raised as a Jayne, I’m under constant scrutiny. The rock band my brothers formed makes it impossible to stay under the radar. Paparazzi, tabloids, rabid fans–you name it and I’ve got it. It all makes me sick. But getting shipped off to crazy Aunt Betty’s house in my senior year of high school isn’t any better. After all, there isn’t a stray kid or pet in the world that my aunt wouldn’t take in. Then I meet her. She’s cautious, suspicious, and not interested in me at all. But that’s fine by me. Sivan Holt may be beautiful and intelligent, but she’s nothing I’m looking for. Drowning, In my past. Struggling to feel settled. And finally, I do. Growing up in the foster care system, I longed for a sense of belonging. All I wanted was a place to call home. At the age of seventeen, I’m finally starting to feel it here. Home. When he comes along, it unsettles me. I don’t want him to ruin everything we’ve built–everything that matters. Jax Jayne is arrogant, privileged, and I want nothing to do with him. But those green eyes of his keep drawing me in. If I let down my walls, will it be my final undoing? MK Harkins has always been a voracious reader. After hitting a dry spell of reading material, she decided to write the kind of book she’d like to read. This resulted in the creation of her debut novel, Intentional. (Award for Best Sweet Romance – eFestival of Words- August 2014) Unintentional, Breaking Braydon, Taking Tiffany and The Reader soon followed. MK’s newest, Famous by Default, released March 2017. The follow-up to The Reader, The Jack, is due out 2017. When she’s not writing novels, she likes to spend her free time traveling the world, splashing in mud puddles (She lives in Seattle, what can she say? ), watching movies and reading (!) She LOVES to hear from her readers! Krysten Hager has been at it again. Her new YA contemporary romance – Dating the It Guy – was released earlier this month. Check it out. A short excerpt appears at the end of this post.